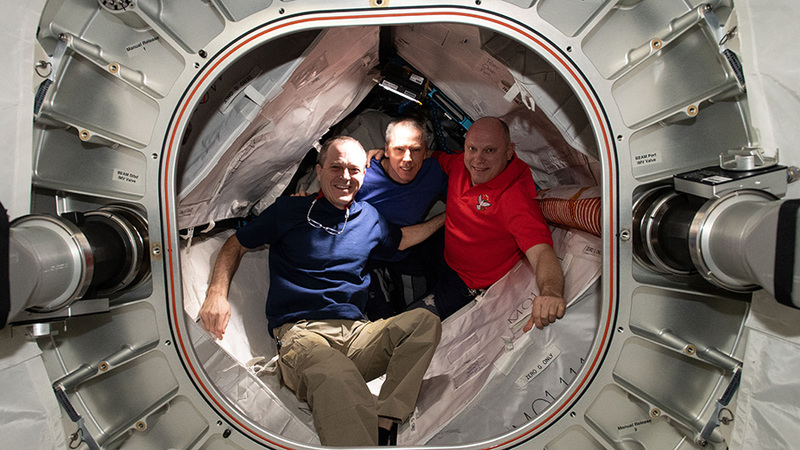 Expedition 55/56 crew members (from left) Ricky Arnold, Drew Feustel and Oleg Artemyev, pose for a portrait inside the Bigelow Expandable Aerospace Module (BEAM). The Expedition 56 crew is ramping for a busy traffic period at the International Space Station during the next couple of weeks. This all comes as the orbital residents ensure BEAM’s operational life and continue ongoing microgravity science. Japan’s seventh “Kounotori” resupply ship is nearing the orbital complex and closing in for a Thursday morning capture. Commander Drew Feustel practiced on a computer today the procedures he will use when he commands the Canadarm2 to grapple Kounotori around 8 a.m. NASA TV is broadcasting the live coverage of the HTV-7 arrival and capture starting at 6:30 a.m.
Feustel is also getting ready to return to Earth on Oct. 4 with crewmates Oleg Artemyev of Roscosmos and Ricky Arnold. During the morning, the three crewmates checked the Sokol launch and entry suits they will wear when they reenter Earth’s atmosphere inside the Soyuz MS-08 spacecraft. The commander also joined Flight Engineer Serena Auñón-Chancellor opening up the Bigelow Expandable Activity Module (BEAM) for maintenance and stowage work.The duo reinforced and stiffened struts inside BEAM to increase its safety margin and extend its operational life. They also stowed a variety of hardware inside the station’s newest module. DNA sequencing from microbe samples is taking place onboard the station today to help scientists understand the impacts of living in space. The atomization of fluids continues to being studied potentially improving fuel efficiency on Earth and in spacecraft. A variety of space gear housing experiments and research samples was checked out today as part regularly scheduled maintenance. Thanks for the good work at NASA/ISS. How do the crew manage to do any repair work in/on the ISS considering the speed at which the ISS moves. Can any door/window be ever opened to enable any of the crew to get out?